"The next economic boom is going to happen in northern Canada and Churchill's going to be a part of that." So says Mike Spence, a part Cree Indian and part Orcadian Scot who is mayor of the tiny Canadian settlement of Churchill on Hudson Bay. When I first arrived in the sub-Arctic town in early October, I found his claim hard to believe. No one was on the streets as I wandered alongside a freight train which had just arrived from Winnipeg, 1000km (600 miles) to the south. Behind me was the port and the towering granary building - concrete and almost windowless. Ahead the countless railroad trucks of grade A Canadian grain stretching far beyond the scattering of Churchill's low lying buildings. Countless, because I had been warned not to stray beyond the town's limits as this was the beginning of polar bear season. The weather forecast had suggested a 40% chance of snow, but instead there was low cloud and rain, with no sign of any ice yet on the slate grey water of Hudson Bay. Winters are coming later to Churchill these days, and it's global warming which Mike Spence reckons will bring the town's big opportunity. "We need to define the benefits of climate change - and there are many. Look at a map of Northern Canada - there's only one deep water port and Churchill is it," says Mr Spence. With the latest estimates of ice-free summers in the Arctic as early as 2013 and the Northwest Passage becoming navigable for the first time this year, Mr Spence claims that Churchill could find itself at the centre of a new network of international shipping routes. Churchill can look to northern Europe as well as Asia, which puts it slap in the middle of an Arctic sea route that bypasses the Panama Canal and could shave two weeks off the journey between east and west. And if Churchill is to be the first boom town of the globally warmed age, one US company stands to do very nicely. 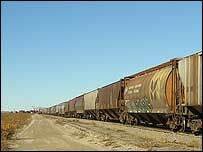 Ten years ago the dilapidated port and railroad were bought for just 10 Canadian dollars (£5; $10) by Omnitrax, a transportation services company based in Colorado. Not a bad price for derelict infrastructure which nobody wanted because it was ice-bound eight months of the year. That C$10 now looks like a very good investment indeed and while managing director of Omnitrax, Mike Ogborn admits that global warming was not a topic around the board table in Denver at the time, it certainly is now. "We already see a lengthening of the season by at least two weeks and we anticipate that that trend will continue," he says. "My big vision is that the port will be as busy as a beehive at least six months of the year, serving North America, Europe, the Middle East and Asia." That optimism is shared by the man who negotiated the sale to Omnitrax, Canadian statesman Lloyd Axworthy, minister of transport at the time. "If you look at the transportation potential there are all kinds of opportunities which, 10 years out, I think could quite dramatically change the entire sea transit system, globally." He envisages Churchill as the key link in a chain, which would see goods arriving by ship from Europe and Asia, and then distributed by rail throughout North and Central America. But the big vision for Churchill is not quite so clear out in the harbour where a tanker approaches through the mist to pick up that trainload of grain. It is sailing in with empty holds and, as pilot Brian Moulton explains, that is the norm. "The inbound cargoes are few and far between. Usually, coming in, it's in ballast," he says. "This year they have just one Russian fertiliser ship coming in." That single Russian shipment, late in the season, was a historic arrival. It was the first to use a proposed new route across the Arctic between Murmansk and Churchill. Politicians have branded it "The Arctic Bridge". "What we have demonstrated is that this route is possible and is worth trying. 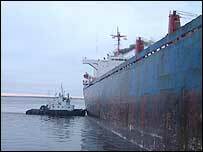 Now it is up to Churchill to market itself," says Pavel Sarbashev from the Murmansk Shipping Company. On my last day in Churchill, Canadian Prime Minister Stephen Harper flew into this small community to announce a C$68m investment in the port and railway. "As the world beats a path to our Arctic doorstep, our government is working hard to ensure that Canada is ready to greet them when they arrive," the prime minister told the town's residents. 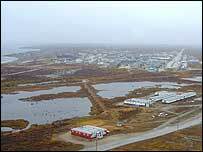 Less than one thousand people live in Churchill. For the moment. It is impossible to imagine how this neat and well kempt little town, rather beautifully landscaped from the rock and the scrubland on the banks of the Hudson Bay, will change if it does become a boom town in a warmer world. And not that I want to pour cold water on its bright future, but as I leave for home I consider the natural as well as the economic uncertainties ahead. For if sea levels rise too much, or the permafrost softens underneath the railroad, or Hudson Bay clogs up with ice floes from a disintegrating ice cap, or the Gulf Stream shifts direction, then Churchill's big chance could melt away.